I took another day trip to visit Crone Pond and I decided to walk further down into the alpine meadow. The wildflowers were poking their heads from out of a freshly melted glacier. The sun was sparkling creating a glittery surface of patches of snow that had not been found by the warm summer sun. The spring at Crone Pond found it’s way down the alpine meadow tumbling over mossy rocks and soft soil so full of moisture that one step off that path would leave an impression on the fragile earth. But it was the majestic trees, that were the kings and queens of this alpine paradise. One of the old ancestor trees, who had given up its life years ago was what caught my eye. Its unusual form drew me closer to the area it inhabited. All its bark had been stripped by both weather and time. All that was now left of the tree was the red inner bark barring it’s nakedness to the open sky. But it was not even the form that had caught my eye it was a burnt area of the tree, that I made me take a second glance. 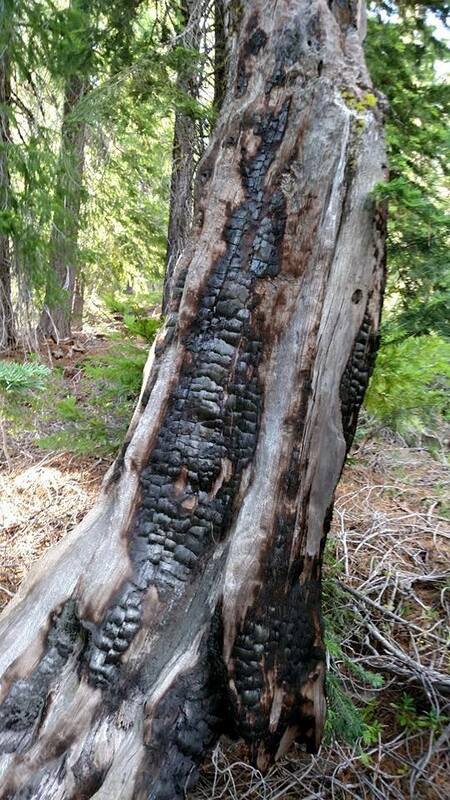 The tree had been struck by lightening and was blacken and chard, but this burnt area was the perfect profile of a Native American Warrior with one eagle feather coming out of his head. I step back to admired the art form crafted by the hand of Mother Nature. The spirit of the land left its mark on this area, but why? I looked down and I began to dig with a stick in the earth. And low and behold another freshwater spring came bubbling up to the surface of the Earth right below the feet. All of this got me thinking about what was the Mirror of Mother Nature teaching me? Finding a freshwater spring is a symbol of going back to the “Source” in Nature’s Bible. But the signature of this area was different then Crone Pond. This spring was teaching about the male energy which works very differently then female energy. The Burned out Warrior needed to stop right at the very foot of the hidden spring. Yang or the male energy, and this type of energy can be found in a man or a woman, pushes through to get things done. The problem with to much yang energy it is like fire and to much fire can burn us out. We see this in our modern world all the time. We push through even when it would be far wiser to collect ourselves rest and then go into action. The Burn Out Warrior Spring was teaching me how to draw from my Inner Source to refuel. I had to dig deeper to find the secret of this spring. It was hiding just beneath the surface of things. Sometimes the answers to all our problems in life is just about getting quiet finding one’s own center. It does not mean all the answers are given at once. But from a quiet place one can find the right answers for what is needed in any given moment then one can push forward full speed ahead. When I find myself in nature I see every tree, flower or rock as my teacher, if I just slow down long enough to look deeply and listen with my heart all the answer are simpler then one may think. So yesterday I was at the male Springs at crone pond. I found this hidden Springs choked by wild trout lilies several years back I clean out the plants allowing the source of the Springs to be free again to happily flow down the alpine meadow. This tree marks this alpine Springs. Look closely and you will see a profile of an Indian warrior where the lightening hit the tree. See the warrior’s eagle feather at the top of his head? I call this Springs the Burned out Warrior Springs. A place where man can return to his Source to be healed by the healing Waters of Mother Nature. To let go of the burdens and disappointments of this world and be given the Spiritual Vision of the Eagle.